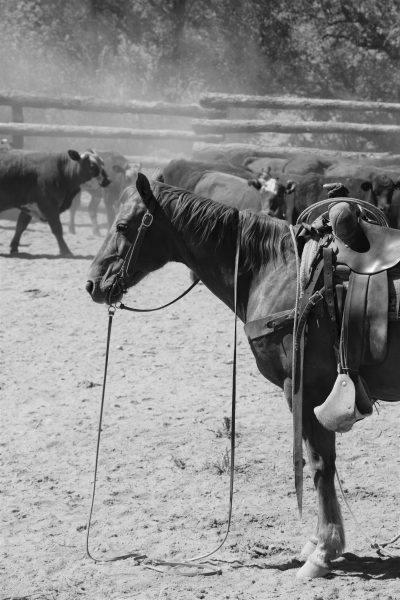 Cowboying hasn’t changed all that much in 150 years or so. 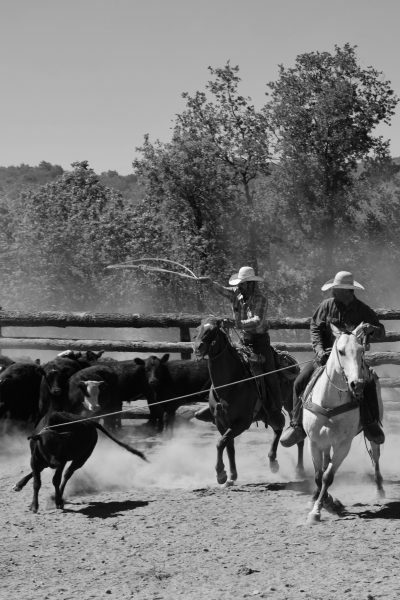 These black and white images taken at the Triangle N camp of the O RO Ranch in northern Arizona during the spring wagon in May of 2018 show the timeless nature of the occupation. 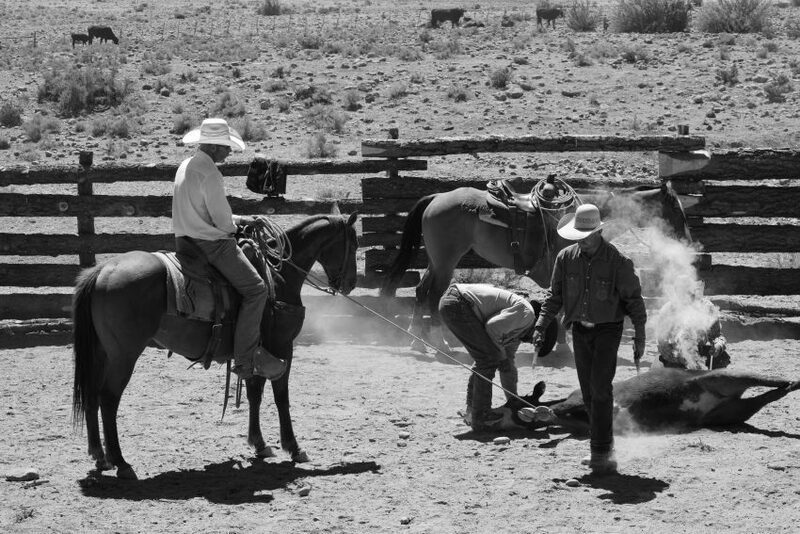 Here, Creek necks a calf and waits for another member of the crew to heel it for branding. Creek was one of the younger guys on the crew. After he hired on as temporary help for the duration of the spring wagon, he stayed on as a full-time cowboy. Left: Creek heads toward the fire while Skyler, who took care of the Mahon camp, comes in to pick up the heels. 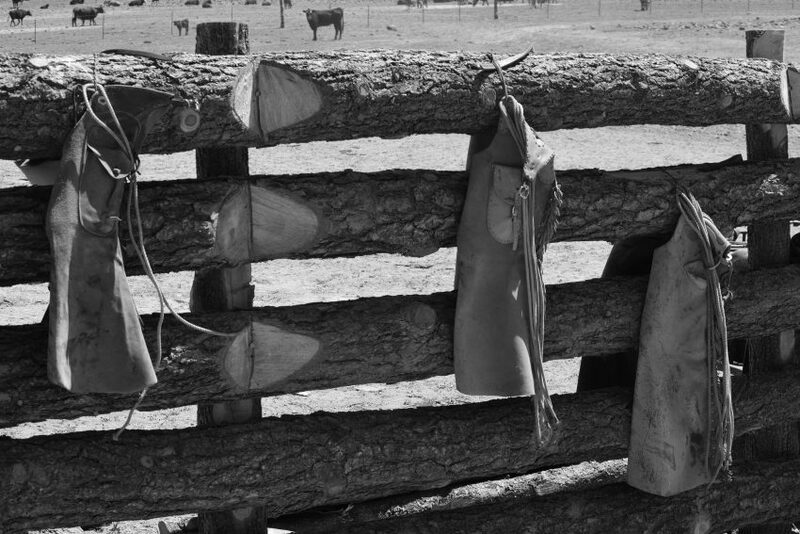 Right: Branding on a big outfit during the spring wagon is different than branding on a smaller family ranch. Instead of a huge social event with all the neighbors, a bunch of kids on a flatbed pickup, and an ice chest stocked with cold beverages, it’s about 8 guys sweating in the dust and drinking questionable water from an old Igloo jug. Thusly, there is no distinct roping crew/ground crew at any given time. 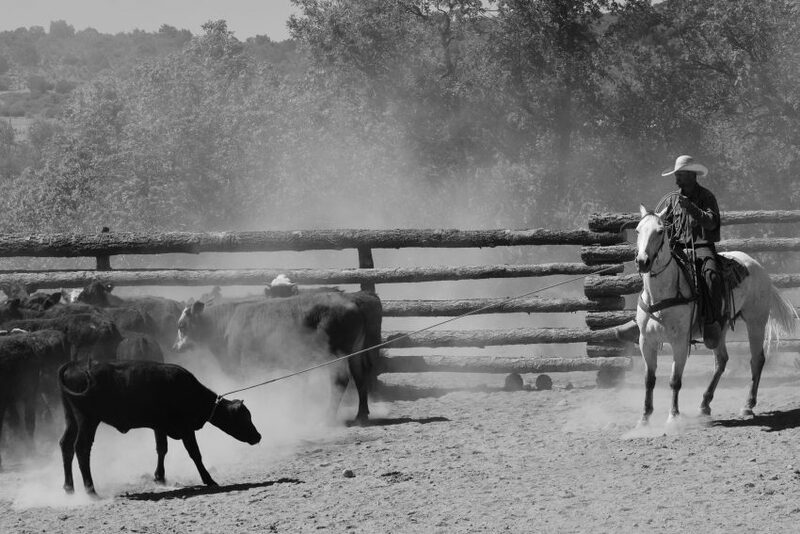 Everyone starts out horseback, and whoever didn’t catch the current calf jumps off his horse and runs to get the branding iron, vaccine gun, and other necessary tools. Their horses learn to wait patiently. RO’s cowboss Jason Kirby holds his dallies while waiting for the cowboys to finish working a calf. 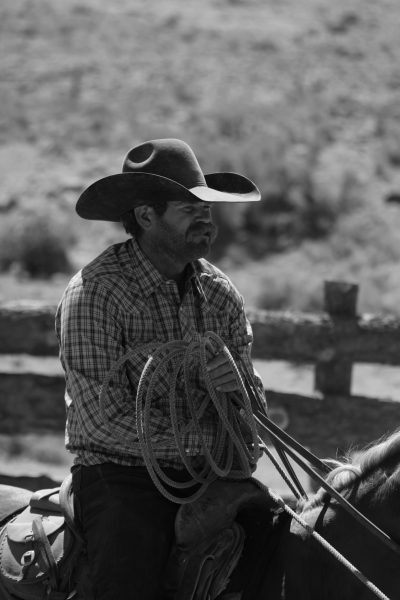 Disregard most of the stereotypes you’ve heard about cowpunchers of the Southwest; most know how to dally as well as tie hard and fast. They may dally on super-sticky black mulehide stamped with “Goodyear,” but they are at least semi-familiar with the wrapping-around-the-horn system. Francis Creek camp man Mike Blair holds the front feet tight while the crew works a calf. Cowboys always wear chaps, unless it’s too hot to wear chaps. The RO’s cowpunchers all started their workday fully dressed, but they shed their bell leggings when the mercury climbed too high in the thermometer for comfort. 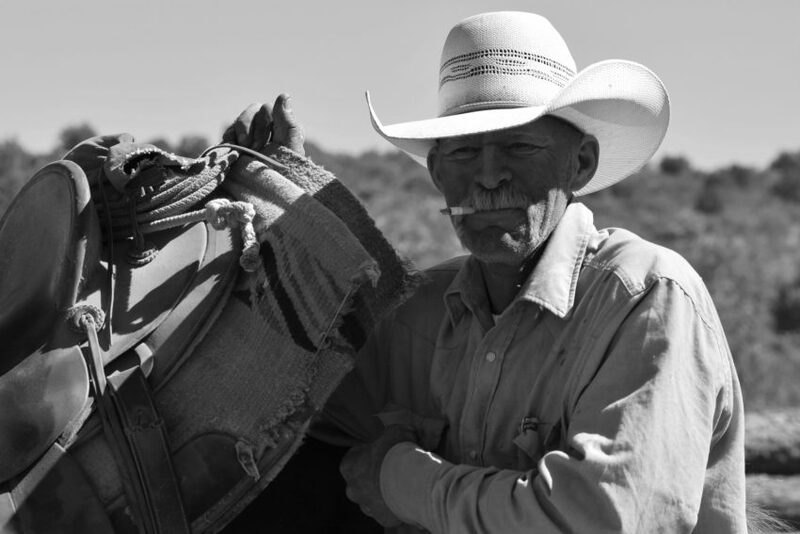 Mike Blair airs out his horse’s back and enjoys a cigarette after a long, hot, dusty day of branding big calves. When the sun was about an inch off the western horizon each evening, it was time to catch the next day’s horses at wagon camp. 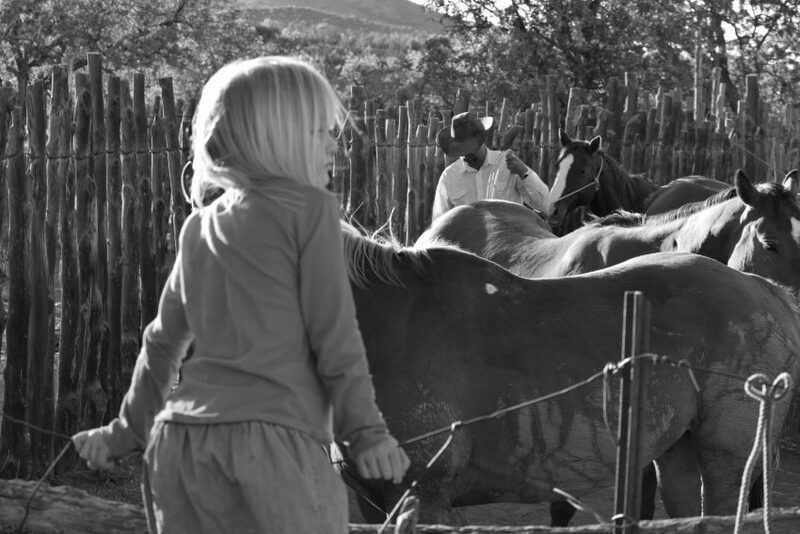 Here, my husband Jim leads a cowboy’s horse out of the remuda and into the night lot while our five-year-old daughter Grace looks on. This way, the horses are easier to catch before first light the next day. Jim took a few minutes to pet the kids’ dog (his dog?) with his son while the crew relaxed and visited near the barn. 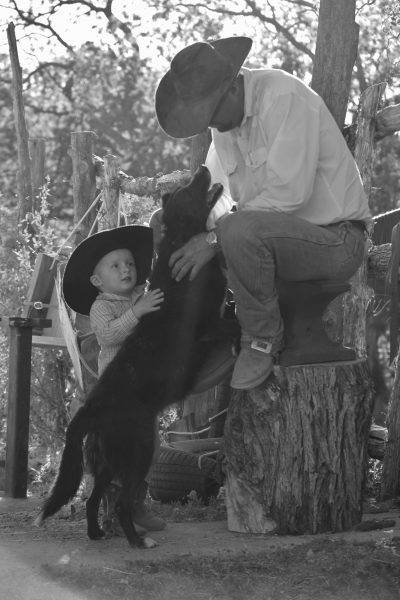 The kids and I enjoyed walking out to the barn to visit with the cowboys at the end of each day. This was also a time for the cowboys to shoe a horse if necessary, rope the dummy, walk around with their shirt untucked, and relax. 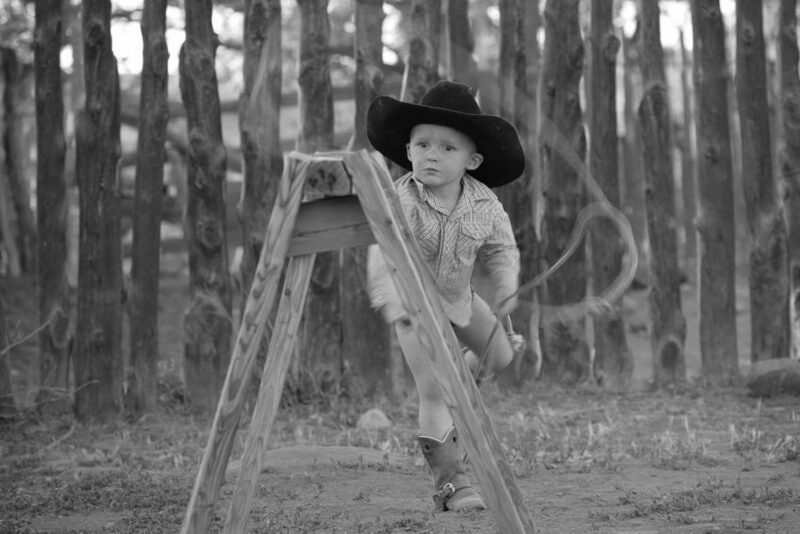 It was also a time for two-year-old Milo to throw his rope at the dummy in the audience of real cowboys. He definitely took advantage of the situation – even without pants – and usually conned one of the guys into rebuilding his loop after each throw. Nobody seemed to mind, because this is the only way to ensure that cowboying will continue for another 150 years or so.